AS IT STANDS: New Lego Figurines I'd Like To See! Have you heard about the latest Lego figurines? They're a politically correct trio. There's a hipster stay-at-home dad in plaid, his professional working wife, and a kid in a wheelchair. 1) Presidential Candidates from both parties. Can you imagine the fun Trump followers will have using their hero to build giant Lego wall's for America's Mexican and Canadian borders. 2) Ethnic Figurines: Muslims. Mexicans. Asians and African-Americans. 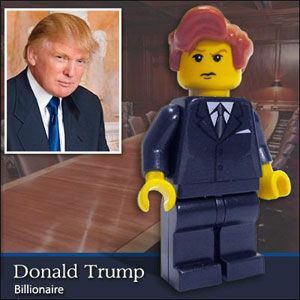 These sets/segments of society are handy if you have the Trump Lego set, the Cruz Lego Set, or the Rubio Lego set. 3) Gangster Figurines: With over 33,000 violent street gangs to choice from only hard-core Lego collectors will ever get this whole set. I have many more ideas, but I think the three above are enough for one day.